The day before you are to use the recipe, in large saucepan bring beans and water to boiling. Reduce heat and simmer, covered, for 1 1/2 hours. Pour beans and liquid into bowl. Cover and refrigerate overnight. 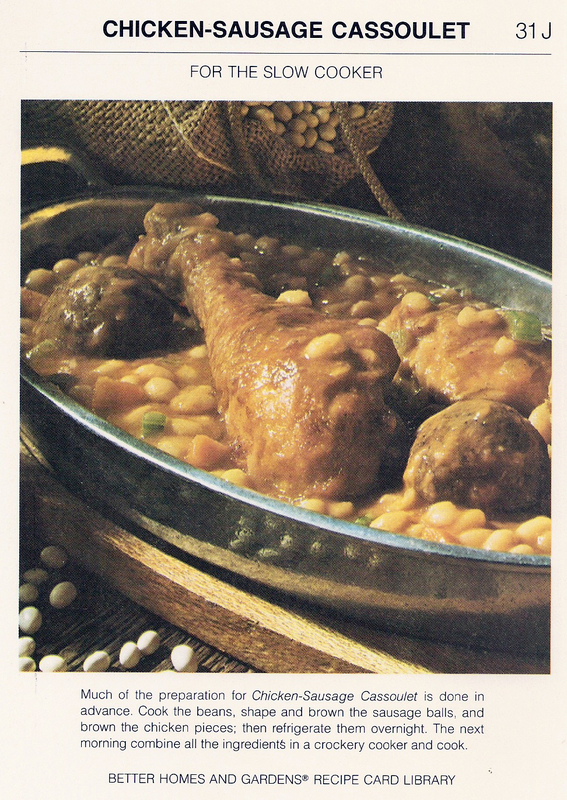 While beans simmer, shape sausage into 18 balls; brown the meatballs in a skillet. Remove meatballs, reserving drippings in skillet. Cover meatballs; refrigerate overnight. Sprinkle chicken pieces with salt and pepper; brown in the reserved drippings. Remove chicken; cover and refrigerate overnight. The next day, in an electric slow crockery cooker place chicken, meatballs, carrot, celery, and onion. Drain beans; mix beans with tomato juice, worcestershire sauce, bouillon granule, and seasonings. Pour over meat mixture in crockery cooker. Cover; cook on low heat setting for 8 hours. Remove chicken and meatballs. Mash bean mixture slightly; serve with meat. If desired, serve with toasted French bread slices. Makes 6 servings.